Maccabi’s David Weiner reports on a night in Sydney where the NSW Jewish sportsmen and sportswomen were honoured for their efforts…and treated to a peek into the life of rugby great Wallaby Glen Ella who now coaches the Jewish club’s union side. FROM MACCABI JUNIOR TO AUSTRALIAN OLYMPIAN? FINGERS CROSSED! Steven Solomon took out the Lou Rose MBE Sportsman of the Year ahead of another Australian representative, karateka Anthony Tockar. We have our fingers crossed for Steve, who was a Maccabi footballer just four years ago, as he vies to qualify for a spot in Australia’s athletics team for the London Olympics later this year. 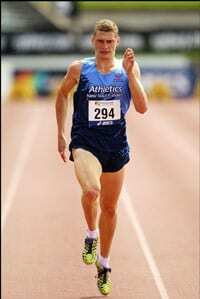 He won our award for his breathtaking feats in 2011: Australia’s Open and Junior 400m Champion, a record breaker in the Combined Associated Schools 200 metre event, and a member of Australia’s 4 x 400 metre relay at the World Championships. 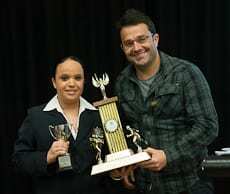 The delightful Sammi Kadar impressed so much again in 2011 that once again the judging panel elevated her nomination from the junior to senior category, awarding her her second consecutive Mick Brandon Sportswoman of the Year Award. To hear more from Sammi, here’s a profile we did with her earlier this year, when she was off to represent Australia in Sweden. 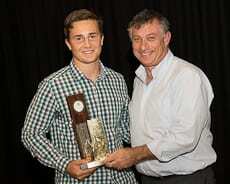 It was fitting that on a night we heard from one of Australian schoolboys rugby’s most famous names, the winner of our Leo Kellerman Junior Sportsman of the Year was selected in the same side. Year 11 Scots student David Horwitz was selected last year at flyhalf to represent Australian Schoolboys against England and New Zealand. “All of the players selected will be given an opportunity at one of the five Super 15 clubs in Australia and it will be up to (Horwitz) if he can take it. 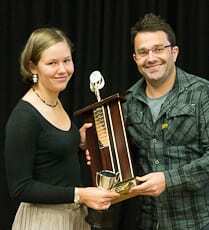 In the outstanding Nahum Opit Junior Sportswoman of the Year prize, Elizabeth Barel emerged victorious, for her exploits in athletics last year. 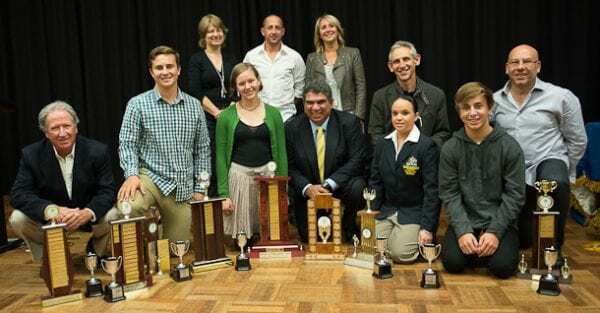 Elizabeth finished last year as the under-14 national pole vault champion in both the club and school based championships, while breaking the state championship record at te NSW All Schools in October. Although Athletics NSW does not keep formal records for u-14 age group yet, Elizabeth set an unofficial record with her own ‘personal best’ jump of three metres last year. And she can run too! Elizabeth won silver in the 100m at the NSW Junior Champs and anchored NSW’s relay team to silver at the nationals, where she was a finalist in the individual event. 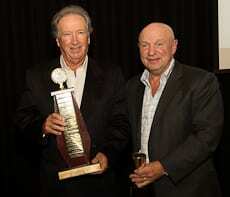 Roy Van DerSluis picked up the Lawn Bowls Percy Weinstein Memorial Masters Sportsman Of the Year Award. A veteran of Australia’s Maccabiah teams, Roy went one step further in 2011 by gaining selection for Australia’s Seniors Golf Team. Roy finished 2011 ranked Australia’s No.3 Senior Amateur player, a year in which he played against New Zealand (undefeated) and in the Asian Pacific Championship in Perth, where he was tied for first in the individual event. Roy was also the senior champion and foursomes champion at the Lakes Golf Club, amongst a CV of other impressive results across the country. Half Marathon star Viv Wiener was out and about running overseas, but was a worthy winner of the Phyllis Glasser Master Sportswoman of the Year Award. Viv came first out of 24 women in the 60-69 female age group in the Blackmores Half Marathon last year. Then, despite tearing hamstring a fortnight before the Blackmores Half Marathon, Viv still claimed first place – achieving her goal to win both events when she turned 60! Bravo! Everyone knows that Maccabi – and all community sports clubs – revolve around the work of hard working volunteers. Maccabi is blessed with some of the best. 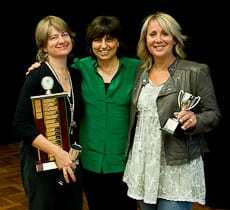 The netball club’s Debi Weiss and Lauren Ehrlich picked up the Louis Platus OAM Club Administrator of the Year. 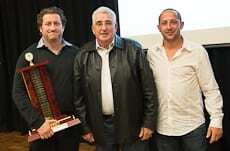 Long-standing Maccabi administrator Peter Grunfeld took out the NSW Jewish Board of Deputies Administrator of the Year, recognition for his sterling contribution at NSW, Futsal and Football level throughout 2011. “A lot of people ask what were the highlights of 2011? I can honestly say taking the team to Vienna was a fantastic highlight. Not because we won gold, but because of the opening ceremony,” Peter reflected. “We sung Hatikvah, right outside Rathausplatz, the area the SS occupied in 1938, where my father and his family left from in Vienna. It was an amazing experience, memories that will live with me forever. You can’t do much more than win every competition you enter, and then represent Australia on the world stage. 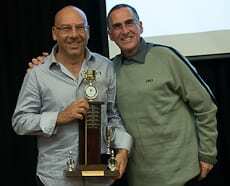 It was a seminal year for our Maccabi Hakoah Futsal Club, who picked up the Michael and Betty Golland Club Team of the Year Award. The New Zealand national, F-League (Australian national) and NSW Super League titles went alongside gold at the European Maccabi Games in Vienna. The club produced international players Jordan Mundell and Jarrod Basger. But importantly, the club enjoyed success at junior level for the first time, winning the under-12 Super League crown. As club leaders John Myers and Gareth Naar (pictured with John Rosen) pointed out when accepting their award, that’s a monumental step forward for a club eyeing success from the bottom all the way up, not just at the elite level. 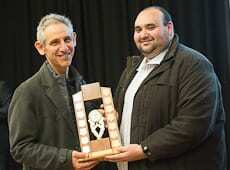 And finally, our Tennis Club took the honours as the Australian Jewish News Club of the Year. “It’s a tremendous honour,” club president Steve Goldberg (pictured with the AJN’s Josh Levi) told Maccabi News. “We’ve got to keep putting that effort in to keep growing our junior and adult base. “The recognition is a real honour; it’s not what we do it for, but it’s great. “We value being part of Maccabi because of what it means for our community. 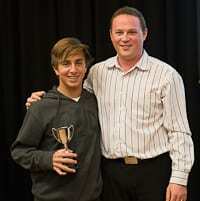 Dylan Chilchik and Lauren Coppel won the David Sellinger Award for outstanding sportsmanship at Junior Carnival. • In addition to the courts available to the community at White City, Maccabi Tennis entered into a lease for its old courts at Wellington Street, Bondi, with an eye specifically for junior tennis. • Senior membership has risen by 20 per cent to 220 members. • The club has run specific programs and social activities targeting 18-30 year olds. – Scholarship program. Mitch Maloon was the first recipient of the program. Glen Ella has enjoyed involvement in the highest level of Australian rugby, but his involvement at our Maccabi Rugby Club in suburban rugby has reminded him how much he loves coaching the sport. Those of us at the Moriah Drama Theatre on Tuesday night were privileged to listen to Ella, our guest of honour at the NSW Jewish Sports Awards. Glen had the audience glued as he talked to MC Anthony Goodridge about his upbringing as one of 12 Ella kids, growing up playing sport at Matraville High School, touring with the Australian Schoolboys and his decision to choose rugby union over rugby league. But when asked about the pinnacle in his rugby life, Ella couldn’t help but digress to reflect on the enjoyable time he is now having at our own rugby club. “I get asked a lot about my highlight, but the thing about sport, regardless of the sport and the level, there’s so many instances where you enjoy a pinnacle – whether it’s on tour, for Australia, for NSW, for Randwick,” Ella explained. “For example, last week we were playing Redfield, the undefeated champions from the last two years and we were leading with three minutes to go. “They then scored a length of the field try and won, but I felt so proud of the Maccabi boys. “It’s funny, but you get different things that you’re proud of. The effort the boys put in, they busted their backsides, running into a very stiff second-half breeze. “The effort they put it in, while it’s not right up there with my career highlights, it’s (it ranks somewhere below). “People have asked me why I’ve decided to coach Maccabi. 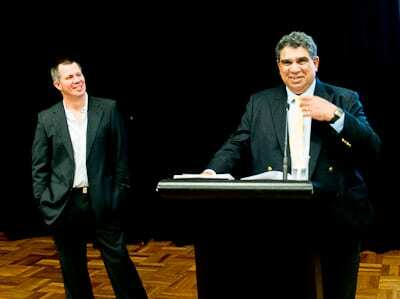 I’ve been involved in the highest level of coaching for many, many years. With elite players, they think they know everything! Not across the board, but a lot don’t think they need coaching. I was at the stage down at Eastern Suburbs, I was getting peeved; you try to coach the young ones and they come out of school and think they know everything. “But – from the first training at Maccabi, everything I’ve said, they lapped up. “I’ve told the boys this – I’m coaching again, not just managing a system. We do lots of contact; there are different levels. We have guys that should be playing first grade or second grade at any club in Sydney. Then we have guys that 16, 17 years of age, playing for the first time, so there’s a vast different in ability. But everyone pays attention. “When we played a trial against Randwick earlier in the year, my wife and my daughter were there and they said after the game: ‘We couldn’t believe it. At half-time, when you spoke, everyone listened. When you finished the game, everyone shook your hand and said thank you’. “These guys, they’ve given me a new lease of life, seriously. “I’ve been up at this (the top) level, and I might be down at this level (of rugby) now, but let me tell you, they’re bringing me up. Glen has also opened the door for some remarkable opportunities for our players.